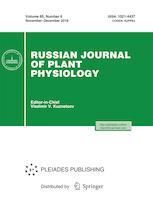 Russian Journal of Plant Physiology is a leading journal in phytophysiology. It embraces the full spectrum of plant physiology and brings together the related aspects of biophysics, biochemistry, cytology, anatomy, genetics, etc. The journal publishes experimental and theoretical articles, reviews, short communications, and descriptions of new methods. Some issues cover special problems of plant physiology, thus presenting collections of articles and providing information in rapidly growing fields. The editorial board is highly interested in publishing research from all countries and accepts manuscripts in English. Russian Journal of Plant Physiology is a peer reviewed journal. We use a double blind peer review format. Our team of reviewers includes over 350 reviewers, both internal and external (95%), from 11 countries (Russia, China, Germany, France, Italy, USA, Great Britain, India, Ukraine, Belarus, Lithuania). The average period from submission to first decision in 2017 was 1 day, and that from first decision to acceptance was 10-180 days. The rejection rate for submitted manuscripts in 2017 was 50%. The final decision on the acceptance of an article for publication is made by the Editor-in-Chief and the Editorial Board.